We’d love your help. Let us know what’s wrong with this preview of Rise to Rebellion by Jeff Shaara. Jeff Shaara dazzled readers with his bestselling novels Gods and Generals, The Last Full Measure, and Gone for Soldiers. Now the acclaimed author who illuminated the Civil War and the Mexican-American War brilliantly brings to life the American Revolution, creating a superb saga of the men who helped to forge the destiny of a nation. In 1770, the fuse of revolution is lit Jeff Shaara dazzled readers with his bestselling novels Gods and Generals, The Last Full Measure, and Gone for Soldiers. Now the acclaimed author who illuminated the Civil War and the Mexican-American War brilliantly brings to life the American Revolution, creating a superb saga of the men who helped to forge the destiny of a nation. In 1770, the fuse of revolution is lit by a fateful command--"Fire!" --as England's peacekeeping mission ignites into the Boston Massacre. The senseless killing of civilians leads to a tumultuous trial in which lawyer John Adams must defend the very enemy who has assaulted and abused the laws he holds sacred. The taut courtroom drama soon broadens into a stunning epic of war as King George III leads a reckless and corrupt government in London toward the escalating abuse of his colonies. Outraged by the increasing loss of their liberties, an extraordinary gathering of America's most inspiring characters confronts the British presence with the ideals that will change history. John Adams, the idealistic attorney devoted to the law, who rises to greatness by the power of his words . . . Ben Franklin, one of the most celebrated men of his time, the elderly and audacious inventor and philosopher who endures firsthand the hostile prejudice of the British government . . . Thomas Gage, the British general given the impossible task of crushing a colonial rebellion without starting an all-out war . . . George Washington, the dashing Virginian whose battle experience in the French and Indian War brings him the recognition that elevates him to command of a colonial army . . . and many other immortal names from the Founding Family of the colonial struggle--Abigail Adams, Thomas Jefferson, Joseph Warren, Samuel Adams, Richard Henry Lee-- captured as never before in their full flesh-and-blood humanity. More than a powerful portrait of the people and purpose of the revolution, Rise to Rebellion is a vivid account of history's most pivotal events. The Boston Tea Party, the battles of Concord and Bunker Hill--all are recreated with the kind of breathtaking detail only a master like Jeff Shaara can muster. His most impressive achievement, Rise to Rebellion reveals with new immediacy how philosophers became fighters, ideas their ammunition, and how a scattered group of colonies became the United States of America. To ask other readers questions about Rise to Rebellion, please sign up. Where can I find summary per chapter? I wasn't sure what to expect with Rise to Rebellion. I had read Shara's Civil War books and knew what to expect in terms of execution. Shara follows a handful of characters throughout the great events of the time so that, as a reader, I receive a first hand view from a number of the key actors on both sides of the conflict. In the case of Rise to Rebellion, the characters are assorted but representative - Gage, Franklin, Adams, Washington, and a smattering of others. The approach is effective. Pa I wasn't sure what to expect with Rise to Rebellion. I had read Shara's Civil War books and knew what to expect in terms of execution. Shara follows a handful of characters throughout the great events of the time so that, as a reader, I receive a first hand view from a number of the key actors on both sides of the conflict. In the case of Rise to Rebellion, the characters are assorted but representative - Gage, Franklin, Adams, Washington, and a smattering of others. The approach is effective. Part of my attraction to historical fiction is learning about new periods of time and how people reacted in those great events. Rise to Rebellion delivers that in spades. The result was not exactly what I had expected but is probably closer to reality and the way that things actually unfolded. There was no rush to rebellion. The colonists were extremely reluctant and initially very opposed to breaking ties with England. It was all very tragic - like watching a car accident in slow motion. It took extraordinary mismanagement and willful ignorance on the part of Royal Governors, Parliament, the King, and generals to effectively force the break. Knowing that the administration was taking a harder line, generals, commanders and Royal Governors, some of the actions are simply mind-boggling. 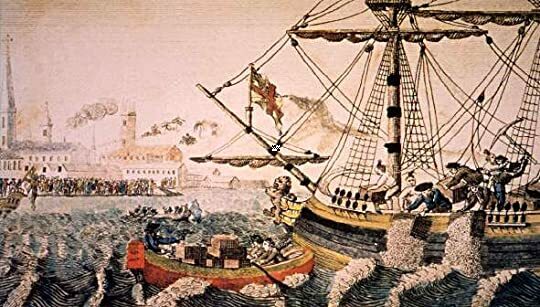 The Gaspee raiding commerce off of Rhode Island, the burning of Falmouth and Charleston, the raiding of farms for provisioning, etc. The British literally drove the colonists into the welcoming arms of the agitators like Sam Adams. Great book. First, I love that it's in novel form; this makes it much more engaging than, say, 1776, which although filled with great info, was kinda dry and hard to get into. Second, Shaara makes the characters so memorable. He has a great knack for bringing characters to life, and while I'm fairly sure he just turns letters into thought monologues, or exchanged letters into conversations, I don't mind. Third, I liked the changing viewpoints and how the story, when told from a British viewpoint Great book. First, I love that it's in novel form; this makes it much more engaging than, say, 1776, which although filled with great info, was kinda dry and hard to get into. Second, Shaara makes the characters so memorable. He has a great knack for bringing characters to life, and while I'm fairly sure he just turns letters into thought monologues, or exchanged letters into conversations, I don't mind. Third, I liked the changing viewpoints and how the story, when told from a British viewpoint, helped me understand those "Lobsterbacks" more empathically. In Rise to Rebellion Jeff Shaara tells the story of the years leading up the start of the American Revolution and the early days of the fledgling American colonies as they discern who they are and what they must do to achieve what they need. It is the story of a growing awareness – as told from the vantage of several prominent contemporaries of the era, specifically Sam, John and Abigail Adams, Ben Franklin, Thomas Gage, and George Washington with others figuring in more minor capacities – of the In Rise to Rebellion Jeff Shaara tells the story of the years leading up the start of the American Revolution and the early days of the fledgling American colonies as they discern who they are and what they must do to achieve what they need. It is the story of a growing awareness – as told from the vantage of several prominent contemporaries of the era, specifically Sam, John and Abigail Adams, Ben Franklin, Thomas Gage, and George Washington with others figuring in more minor capacities – of the currently untenable relationship with Great Britain. The strength of Shaara’s writing is in his adept ability to portray different perspectives despite competing objectives even among parties supposedly on the same ‘side’. For example, it was never a forgone conclusion the American colonies were going to sever ties with, fight for independence from, or form a new political government independent of, Great Britain. Many colonials saw revolution as disloyalty to the King and treason. Recommends it for: Anybody who has a pulse! I had few expectations for this book; it was a used bookstore find. I read it in September, just as I was gearing up to teach American history. So the timing was perfect: this is a book about the early American Revolutionary period, with great details about the battles in Lexington and Concord and the Continental Congress meetings. The history is solid and sound; with enough details for someone well-versed in the subject. I would think that readers who don't teach US history for a living would a I had few expectations for this book; it was a used bookstore find. I read it in September, just as I was gearing up to teach American history. So the timing was perfect: this is a book about the early American Revolutionary period, with great details about the battles in Lexington and Concord and the Continental Congress meetings. The history is solid and sound; with enough details for someone well-versed in the subject. I would think that readers who don't teach US history for a living would also enjoy the book. Shaara does a nice job dramatizing the history; creating individual stories for men like John Adams and General Gage without becoming melodramatic or maudlin. The events are real, some of the conversations are of the author's imagining (based on a solid reading of the facts). The result is engaging. The book is a quick read; well worth your time, especially if you've been sucked in to the Joseph Ellis-style works of late. This book made the roots of the American Revolution clearer to me. I met the Sons of Liberty as real people, and Ben Franklin, and George Washington and the other movers & shakers who drew the Colonies together in defense against the tyranny of the British governors and the Redcoats. It reads like a great novel, but it's history, told in a more lively way here than in our old High School textbooks. 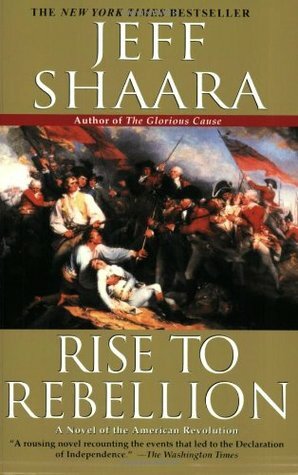 Shaara does a great job building drama around those momentous events known to all: the battles of Lexington and Concord, the Battle of Bunker Hill, etc., but is at his best when he relates those behind-the-scenes intrigues generally known only to historians: Ben Franklin's subtle intrigues in England, the Machiavellian machinations of Sam Adams, the relentless ideological struggles of John Adams in the Continental Congress, etc. It is in these moments that Shaara best captures the personalities, strengths, and failings of these "great" men. Just arrived from USA through BM. Colonists cannot be represented inParliament. Never will be. They simply are not an equal part of the empire. They are not, nor will they ever be, Englishmen. You cannot suddenly decide to tax us, exploit us, drain our resources. You cannot do with us as you please. With your wast army and your great navy, you may have the power. But you do not have the right. This is the first book of the series American Revolution Just arrived from USA through BM. This is the first book of the series American Revolutionary War and describes the story of Sons of Liberty as well as the Boston Tea Party. Several historical characters are very well described in this splendid book, such as: Benjamin Franklin, John Adams, George Washington and Lieutenant General Thomas Gage. In the Shaara style, I was bounced around to the worlds of John Adams, Benjamin Franklin, George Washington, Thomas Gage, and others. The time frame is from Spring of 1770 to the summer of 1776 and the primary settings are Boston, London, and Philadelphia. If you have read and enjoyed McCullough's, "1776", and/or watched the HBO series, "John Adams", you will thoroughly enjoy comparing and contrasting them to the Shaara book as you read it. I found that I became so immersed in the plight of Bos In the Shaara style, I was bounced around to the worlds of John Adams, Benjamin Franklin, George Washington, Thomas Gage, and others. The time frame is from Spring of 1770 to the summer of 1776 and the primary settings are Boston, London, and Philadelphia. I found that I became so immersed in the plight of Boston from 1770-1776 that I started mental planning for a Boston trip to visit, explore, and photograph the places so effectively described in "Rise to Rebellion". I love books about the American Revolution time period. This is definitely one of my favorites. Jeff Shaara has hit upon a great formula which pulls you into the story and teaches something along the way. He does a great job of using fictionalized dialog to convey history without straying too far from the facts. I definitely recommend this book as a starting place for anyone interested in learning more about the founding of our country. This book was ok. And that's about it. The best thing it has going for it is the plot. It is a good depiction of what happened during the lead up to the American Revolution, and it did pique my interest to learn more about Washington and Franklin, who are the two most interesting, quirky characters in the book. The second best thing about the book is that the writing is, for the most part, not annoying. However, there was a particular technique that the author used very frequently, which made it This book was ok. And that's about it. The best thing it has going for it is the plot. It is a good depiction of what happened during the lead up to the American Revolution, and it did pique my interest to learn more about Washington and Franklin, who are the two most interesting, quirky characters in the book. However, there was a particular technique that the author used very frequently, which made it a distracting rather than transparent device that the reader shouldn't have noticed. Each chapter is from the perspective of one of the principal characters — Franklin, Adams, Washington, and so on — and the title of each chapter is just the name of the character whose perspective it is from. So you know right from the beginning who each chapter is about. However, Shaara would begin almost every chapter (especially towards the beginning of the book) with a few sentences referring to "he", rather than stating the character's name, or starting off talking about someone other than the main character of that chapter, or beginning with a description of the surroundings or of an event. I’m not sure what the point of this was, but it got very irritating, not because it is inherently bad, but because it was noticeable that the author was doing the same thing over and over. But the bigger things wrong with the book are that the characterization is not good enough, and there is not enough emotional contrast. If the characterization in this book had been excellent, then the reader would have been able to feel that one chapter was from Franklin’s perspective, the next one from Washington’s perspective, and so on. But, although the events in the story can indicate who is being written about, the tone, the patterns of thought, the speech, and so on — none of those things gave the reader any impression of character. All the chapters were written with the same tone, same type of dialogue, etc. The reader doesn’t feel any difference between any of the characters. The other major flaw is that there is really very little emotional expression in the book. Although I could understand the American colonists’ anger and frustration with the British king and his representatives, I never really felt it. I didn’t feel the fear of an impending battle. I didn’t feel the elation of finishing the Declaration of Independence. It’s all rather emotionally flat. There is much to commend Jeff Shaara for his "Rise to Rebellion." It is an ambitious work that spans seven years of American resistance to British authority bracketed by the so-called Boston Massacre and the thirteen colonies' unanimous declaration of independence from England. Shaara uses the viewpoints of Ben Franklin, John Adams, General Thomas Gage, and George Washington almost exclusively to frame his narration of events. He portrays their thoughts, emotions, and human characteristics skill There is much to commend Jeff Shaara for his "Rise to Rebellion." It is an ambitious work that spans seven years of American resistance to British authority bracketed by the so-called Boston Massacre and the thirteen colonies' unanimous declaration of independence from England. Shaara uses the viewpoints of Ben Franklin, John Adams, General Thomas Gage, and George Washington almost exclusively to frame his narration of events. He portrays their thoughts, emotions, and human characteristics skillfully both by his selection of content and by his use of language. He has obviously done much research. A scene I especially liked has Franklin touring the countryside in Ireland. Observing the downtrodden population, he recognizes that the King and his ministers, having no concept of the nature of their American subjects, are convinced that Americans can be forced into submission and abject subservience as readily as had been the Irish. All that was required to accomplish this was the administration of a heavy dose of unrelenting punishment. Despite these compliments, I've rated the book three stars. I found the book to be a slow read. As much as I value subjective narration, I believe Shaara emphasized far too much what his four famous characters may have felt and thought. The book, 481 pages, provided me little excitement. I judged Shaara's characterization of some of the day's notable participants to be superficial. For example, Shaara portrays Paul Revere as a simpleton who needs Dr. Joseph Warren's instruction of how he is to get across Boston's back bay the night of the British army's embarkation, why he needs to do so, and where he is supposed to ride. In truth, Revere had made the arrangements for his crossing, not Warren; he had ridden to Lexington and Concord a week earlier; and he knew entirely what General Gage was planning. Shaara's narration of Revere's crossing is full of errors. He has Revere's boat rowed by one person, not two. The boat is beached on sand, not received at the old battery dock at Charlestown. Revere is given a large horse to ride by an unidentified person, not the smallish horse he received from Charlestown's militia leader, Colonel James Conant. According to Shaara, Revere sees the two lanterns in the Christ Church tower after he had crossed the bay and realizes then that the British are using boats to reach Cambridge, not the land route through Boston Neck. Before leaving Boston, Revere had instructed the sexton of the church to display two lanterns, while he was crossing the bay, realizing that if he failed to get across, Colonel Conant would need to know how the British army was proceeding. Finally, using one paragraph, Shaara has Revere ride off into the countyside, how far we are not told. He writes nothing about how Revere is challenged by British officers detailed to intercept express riders, how he evaded them, how he alerted Sam Adams and John Hancock in Lexington, how he rode toward Concord with William Dawes and met Dr. Samuel Prescott, and how he was arrested by other detailed British officers while Prescott escaped. Shaara has Major John Pitcairn, whom he identifies as "Thomas Pitcairn," depict the redcoat advance to Lexington, the battle on the town common, the subsequent march to Concord, the exchange of musket fire at the North Bridge, and the entire march back to Charlestown. Nobody else contributes information. It is as though Shaara did not feel it expedient to provide detail or he didn't know the detail. He fills this void of information with generalizations. He provides nothing specific about the activities of Pitcairn's advance scouts, who intercept several militiamen sent out successively by Lexington Captain John Parker to locate the army's whereabouts. He does not mention that the six light infantry companies Pitcairn commands, in advance of the six grenadier companies that the expedition's leader, Colonel Francis Smith, controls, divides in half upon reaching the Lexington common, not according to Pitcairn's wishes; and it is the first light infantry company of the six that opens fire on the 50 some militiamen standing on the common. Shaara has Pitcairn witnessing the fighting at the North Bridge even though Pitcairn never left the center of Concord. The famous incident of Pitcairn falling off his horse and having his holstered pistols, attached to his saddle, carried to the rebels by his horse, takes place no more than a mile east of Concord, one might conclude, in a field, not on the road at Fiske Hill, near Lexington. The extensive use of redcoat flankers to attack militia companies hiding behind trees, barns, and stone walls seemingly did not occur. Shaara does write that Colonel Smith's forces were reinforced at Lexington by another army sent out of Boston by General Gage, but he doesn't mention its commander, Colonel Hugh Percy, who saved the combined forces from annihilation or having to surrender. He does not mention that the worst fighting of the entire day took place subsequently in Menotomy nor how Percy tricked his militia opponents into believing that he intended to cross the Great Bridge at Cambridge and that he sent his forces in the opposite direction, to Charlestown. In one paragraph -- one paragraph -- Shaara narrates Percy's entire retreat, from Lexingto to Boston, neglecting to inform us that the retreat actually ended at Charlestown. I found this book interesting but it read more like nonfiction with so much of the emphasis on the political machinations leading up to the American Revolution. This made for an airy read, packed with ideas and events and the big names of the day, but not the flesh and blood experience of what it felt like to be alive at this moment in history. I was surprised how much I enjoyed the book. I knew the basic series of events leading up to the American Revolution. Shaara put the events into a novel format, which made it more enjoyable. There were a couple times when I looked up information because I was surprised; he did his research! This is a mix of fiction and nonfiction, the events of the 1770s are seen through the POVs of figures such as John Adams, Benjamin Franklin, General Gage, Paul Revere, General Washington, etc. ; each of these men a prominent figure in the American Revolution. From the Boston Massacre through the 1770s, it explores the lives and minds of some of the most prominent historical figures as tensions between England and the American colonies intensity resulting in rebellion and war. Even though both sides are explored, there is definitely a bias toward the American colonies, a given righteousness of the rebels. Honestly, I didn't expect any different from such a novel. The writing style pulls the reader into the events and even thoughts and feelings of the historical figures. However, Shaara doesn't seem able to get away completely from idealizing the founding fathers. The writing is a bit stiff, restrained without the coarseness that is usually associated with reality. Sometimes I forgot I was reading a work of fiction instead of a really good historical nonfiction. I think this may be the result in trying to tackle so many idealized American historical figures in an accurate manner (i.e., non offensive to Americans) while at the same time giving them depth and a three-dimensional feel. The emotional connection with the characters was intermittent, sometimes I was able to connect like I did with Franklin and Washington, but other times no matter how much I tried, some characters seemed plastic such as John Adams. Despite this, it is still an amazing work of fiction and probably one of the best out there on the American Revolution, one that portrays it so accurately and yet in such an interesting manner. It makes American history enthralling and accessible, there is no excuse that any American shouldn't at least know the basics presented in this book (and this book is a brilliant way of obtaining it). I looked forward to this book because I really enjoyed Jeff Shaara’s The Steel Wave, an exciting novel which made me feel as if I were experiencing D-Day myself (but without the personal danger). Alas, Rise to Rebellion, a novel covering the events leading up to the revolutionary war, is not nearly as good. In order to cover the important events, Shaara goes from one leading character to another. Instead of getting us started with the action immediately in each scene, Shaara spends many paragraph I looked forward to this book because I really enjoyed Jeff Shaara’s The Steel Wave, an exciting novel which made me feel as if I were experiencing D-Day myself (but without the personal danger). Alas, Rise to Rebellion, a novel covering the events leading up to the revolutionary war, is not nearly as good. The characters are wooden, far more passive than I would expect from men who fought a revolution. I suspect this may be because Shaara felt intimidated because he was writing about the Founding Fathers, whom we have been taught to revere, and treated them with too much respect. However, he has chosen to add the word “Novel” to his title – he should have been ready to take a few liberties with the Sons of Liberty! Benjamin Franklin’s wit, which should have gleamed like gold, was as tarnished as neglected silver. I appreciate that covering the events leading to a war is a challenging basis for a novel, as it involves many characters, places, points of view, events, and can span several years. Herman Wouk did this well in The Winds of War. Shaara did not. The only chapters which I truly enjoyed were those with George Washington. Shaara is much better when he writes about military action. I do respect the research he did and I did learn a fair amount about the events leading to the revolutionary war. I picked up this book on my own for the chance to get a better look into the colonies and American revolution for my AP US history class and i must say i was pulled into the fictional prospective style of writing than i thought i would be. The books a great read and easy to understand giving both perspectives of English foot soldiers to American radicals. It contains a lot more information than you would think and conveniently places it all in a better to understand time sequence instead of just I picked up this book on my own for the chance to get a better look into the colonies and American revolution for my AP US history class and i must say i was pulled into the fictional prospective style of writing than i thought i would be. The books a great read and easy to understand giving both perspectives of English foot soldiers to American radicals. It contains a lot more information than you would think and conveniently places it all in a better to understand time sequence instead of just memorizing the events. I would enjoy reading it’s sequel to continue solely for the novel style of writing which was a rather new view of it all. The book does a great job of keeping you in the building events of the revolution and portraying historical figures in new lights you probably would never have guessed and gives explicit details on their lives which can help give a better understanding for their course of actions. While the book is still fiction that's for the purpose of keeping the dialog in a fluid state and being able to convey characters views to a higher understanding, but also keeps it to a close historical accuracy. As the author notes, by definition this book is a novel. As true as he tries to be in telling the story through the voices of the characters, in their own words and through their own experiences, the dialogue and thoughts must be read as fiction. Yet it’s very apparent that so very much research has gone into its writing. For some, there might too much information, because the book does skirt the line between fiction and nonfiction, but that made it perfect for me. I haven’t read a lot about the As the author notes, by definition this book is a novel. As true as he tries to be in telling the story through the voices of the characters, in their own words and through their own experiences, the dialogue and thoughts must be read as fiction. Yet it’s very apparent that so very much research has gone into its writing. For some, there might too much information, because the book does skirt the line between fiction and nonfiction, but that made it perfect for me. I haven’t read a lot about the Revolution War, a few novels over the years and a couple of Jefferson biographies, but most of what I know of it comes from what I learned in school. Wanting to know more about this particular period in history, I fell back onto my usual course, which is to read novels set during that time, and moving on to nonfiction later. This book is like getting both at the same time, the ease of a novel with the preponderance of information of a nonfiction book. I learned a lot from this book. While the main story was familiar to me, there were lesser known occurrences, glossed over in school, that gave more depth and breadth to the events, and to the people who brought them about. I've always loved American History, especially the Revolutionary War time, so this book has been on my TBR pile for awhile now. Despite the fact that I own the book I decided to pick up the audiobook at the library to listen to while I work. The audio book is read by Victor Garber and he was great. He did a great job with the character voices, including British and American accents. My only complaint about the audio book was that it was the abridged version! Apparently the unabridged version is I've always loved American History, especially the Revolutionary War time, so this book has been on my TBR pile for awhile now. Despite the fact that I own the book I decided to pick up the audiobook at the library to listen to while I work. The audio book is read by Victor Garber and he was great. He did a great job with the character voices, including British and American accents. My only complaint about the audio book was that it was the abridged version! Apparently the unabridged version is really hard to find (even amazon didn't have it). So now I am going to have to read the book to get the parts I missed. In a few weeks, I'm going to Boston and in preparation for the trip, I decided to read Rise to Rebellion. I could not be happier that I did. This book was fantastic in a multitude of ways. It was a great overview of the beginning of the Revolution and told this incredible story through such eloquent language that parts almost moved me to tears. (Though not fully Jeff Shaara's penmanship, the reading of the Declaration of Independence to Washington's soldiers had me thoroughly choked up. Dr. Warre In a few weeks, I'm going to Boston and in preparation for the trip, I decided to read Rise to Rebellion. I could not be happier that I did. I've long found the American Revolution to be my niche and I would recommend this to anyone looking for more information that isn't just dryly worded facts in a nonfiction history book. Reading the events in this way truly made me feel like I was there. Very good reading! What I most enjoyed about this book was the ease with which I could lay it down for extended periods and pick it up right where I left off, without any lag in interest. This is not always easy for me with standard fictional novels. The fact that this is a"novel," though absolutely historically-based, made it more stable in its connection to truth - i.e. the characters were already well-known to me and digging back into who they were, what their backgrounds were, etc., was neve Very good reading! What I most enjoyed about this book was the ease with which I could lay it down for extended periods and pick it up right where I left off, without any lag in interest. This is not always easy for me with standard fictional novels. The fact that this is a"novel," though absolutely historically-based, made it more stable in its connection to truth - i.e. the characters were already well-known to me and digging back into who they were, what their backgrounds were, etc., was never a necessity. I do however feel there were many more fascinating details about the day-to-day experiences of these important characters that were probably were left out for expediency's sake. For example, after finishing the book I once again picked up David McCollough's 1776 and thoroughly enjoyed rediscovering numerous intriguing details about New York in the spring and summer of 1776 just after Washington's entry following his departure from Boston. Having never read any of Shaara's Civil War works, I was new to his writing but enjoyed this immensely and am currently reading the second part of the story, "Glorious Cause". The book recounts the period of 1770-1776, from the Boston Massacre to the adoption of the Declaration of Independence, as a well-executed novel, primarily from the perspectives of John Adams, Benjamin Franklin, General Gage, and, much later in the book, George Washington. Drawn primarily from their own written words, Shaa Having never read any of Shaara's Civil War works, I was new to his writing but enjoyed this immensely and am currently reading the second part of the story, "Glorious Cause". The book recounts the period of 1770-1776, from the Boston Massacre to the adoption of the Declaration of Independence, as a well-executed novel, primarily from the perspectives of John Adams, Benjamin Franklin, General Gage, and, much later in the book, George Washington. Drawn primarily from their own written words, Shaara seems to get a solid handle on the characters, but due to the narrative focus, some events are given enormous attention, while others are merely included after the fact. Remember all the stuff you learned in grade school about the American Revolution? Neither do I. Hey - it was over 40 years ago. The "Rise to Rebellion," and its successor, "The Glorious Cause," make the entire historical event come alive. Now, of course a lot of the dialog and many of the events in the book need to be taken with a bit of skepticism, because who knows what George Washington really said or thought? But like any good piece of fiction, you are able to suspend your disbelief to enjoy Remember all the stuff you learned in grade school about the American Revolution? Neither do I. Hey - it was over 40 years ago. The "Rise to Rebellion," and its successor, "The Glorious Cause," make the entire historical event come alive. Now, of course a lot of the dialog and many of the events in the book need to be taken with a bit of skepticism, because who knows what George Washington really said or thought? But like any good piece of fiction, you are able to suspend your disbelief to enjoy the story, and still feel like you're getting a history lesson at the same time. I live in New Jersey, and so much of the American Revolution took place here. When I read the book and can picture the towns, roads and even the geography as it's described, the story really comes to life. I had filed this under history; but it is historical fiction---and excellent historical fiction. The books changes viewpoints between several actual persons[----John Adams, Ben Franklin; British General Thomas Gage; George Washington and others. I am no expert but have enough knowledge of history to say that although it is a novel, most of it is solidly based on historical facts. Itclearly shows the feelings leading up to the final break between England and the Colonies. II found it interesting an I had filed this under history; but it is historical fiction---and excellent historical fiction. Itclearly shows the feelings leading up to the final break between England and the Colonies. II found it interesting and thought provoking. Recommended for any fan of historical fiction or history. Jeff Shaara, a descendant of Italian immigrants, was born in New Brunswick, New Jersey ("Shaara" was originally spelled "Sciarra"). He grew up in Tallahassee, Florida, and graduated from Florida State University with a degree in Criminology. From age 16, Jeff operated a rare coin business, first out of his home, then in a retail store. After moving to Tampa, Jeff became one of the most widely know Jeff Shaara, a descendant of Italian immigrants, was born in New Brunswick, New Jersey ("Shaara" was originally spelled "Sciarra"). He grew up in Tallahassee, Florida, and graduated from Florida State University with a degree in Criminology. From age 16, Jeff operated a rare coin business, first out of his home, then in a retail store. After moving to Tampa, Jeff became one of the most widely known coin and precious-metals dealers in Florida. In 1988, Jeff's father, Michael Shaara, died, and Jeff made the decision to sell his business, and take over the management of his father's estate. Onboard the Guided Missile Destroyer USS Mustin in the Persian Gulf. “Dickinson left the rostrum to applause, loud shouts of approval. Franklin was surprised, looked toward Adams, who returned the look, shook his head. The chamber was dismissed, and Franklin pushed himself slowly up out of the chair. He began to struggle a bit, pain in both knees, the stiffness holding him tightly, felt a hand under his arm. Franklin looked past him, saw Dickinson standing close behind, staring angrily at Adams, reacting to his words. “Mr. Dickinson, a fine speech, sir,” said Franklin.